I wanted to find more information on Henry to share with my Grandma and the rest of my family. Henry and his wife, Ida, had 3 children. 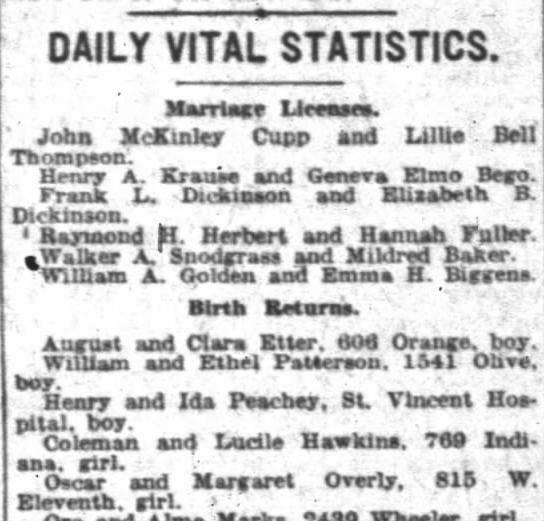 Those three children each found spouses and went on to have almost 20 children of their own, and many of Henry and Ida’s grandchildren now have their own grandchildren. Needless to say, the Peacheys are a large family! So, I set out on a mission to uncover who our patriarch really was. I am pleased to report that my research unearthed a charismatic, funny, talented, and kind man who packed a lot of LIVING into his short time here on earth. Henry Charles Peachey was born on November 24, 1888 in Chicago, Illinois, the son of English immigrants, Henry Daniel Peachey and Mary Ann (Wallace) Peachey, both hailing from London. I believe they came to the U.S. in 1886, though the family rumor is that Henry Jr. was born “on the boat” or “in the port.” In any case, he was a natural citizen of America, the first of his family born on U.S. soil. Henry was the oldest of his 5 siblings: Walter, Clara, Lillian, Annabel, and George. 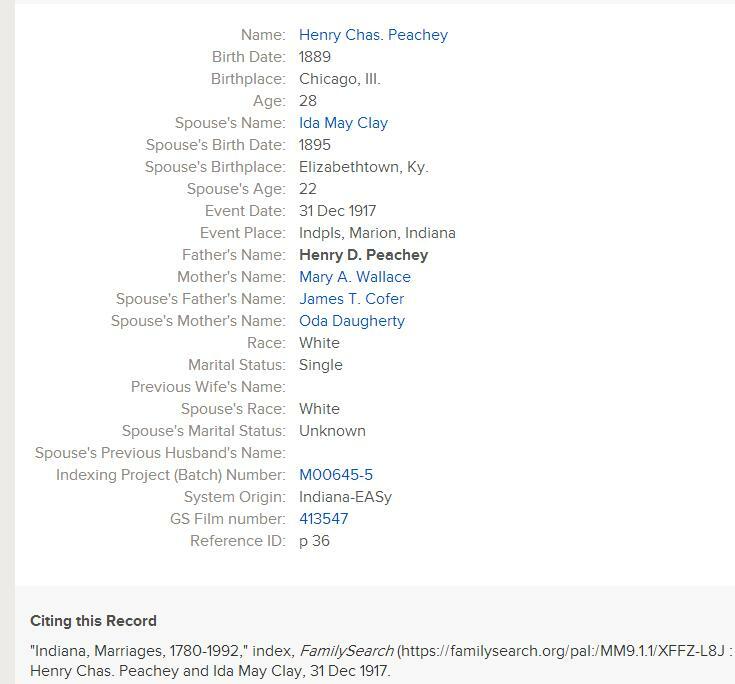 I gathered from other census records that Henry Peachey, Sr. was a grocer, Mary Peachey was listed as a grocer as well, and then later as a cleric. I assume that they were, like many immigrants, of modest means. Add to that the responsibility of raising 6 children and one can assume that this was a group not unaccustomed to hard work. The family definitely had their share of grief. 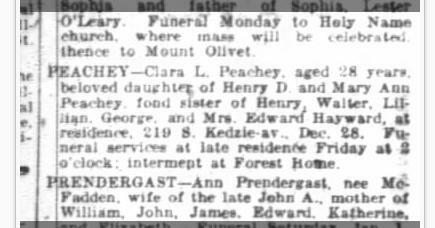 Sibling Clara Peachey died in 1920 at the age of 28, just 3 days after Christmas. I found this obituary in the Chicago Daily Tribune from December 31, 1920. I can find no cause of death, but I think consumption (tuberculosis) or Spanish influenza are likely possibilities, given the year. Your heart almost breaks just reading the words “beloved daughter” and “fond sister.” I really get the feeling that this was a close-knit bunch, a tradition the family proudly adheres to today. Whatever his reasons for relocating, Henry landed in Indianapolis. 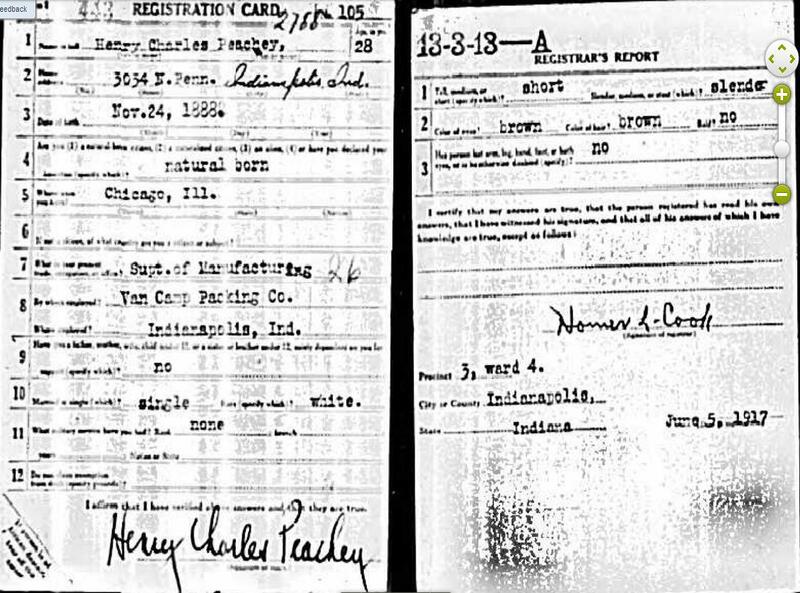 The first records I have of him there are his marriage to my great-grandmother on December 31, 1917 in Indianapolis, and his draft registration card. 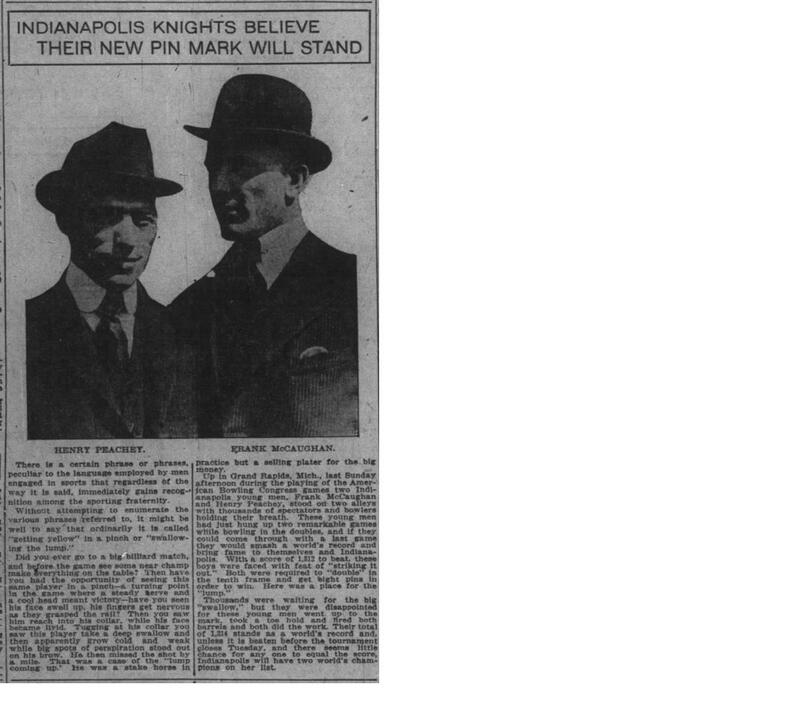 He also registered for the draft for World War I in Indianapolis around that time. Now, some of what genealogists and family historians uncover is unpleasant or hard to process. On the other hand, some items are incredibly fascinating and exciting. Henry is a fantastic example of the latter. As it turns out, he was a world-class bowler. As in, he actually broke a world record! How had I never heard of this?? The meet where he broke the record was held in Grand Rapids, Michigan, where I have stayed before. I wandered the streets of a city in which my great-grandfather broke a world record, and I had no idea. There are several other articles/blurbs about the world record, two of them I found in the Washington Post. In addition, he was in the Indianapolis Star frequently from 1917 through the 1930’s in the sports page, under the bowling section. I had no idea bowling was such a big deal back then! 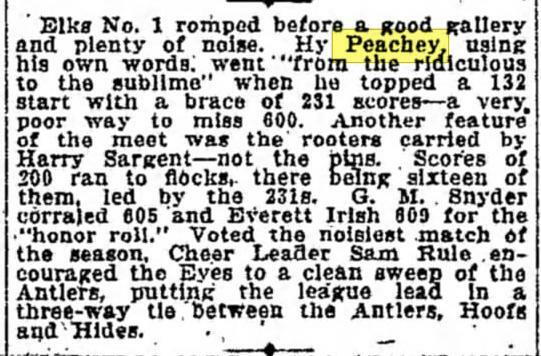 It’s hilarious to me the way he describes how he played, and I love that the paper added the details of the alley being packed and noisy. You can almost feel yourself there, watching, wondering if Henry Peachey is going to pick up his “ridiculous” game. By 1920, Henry and Ida were living with Ida’s uncle, Hardin Cofer, and her sister Fannie Dudley (who my grandma Frances was named after). It’s so interesting to me that here Henry was, this mini-celebrity due to his bowling fame, a world-record holder, but he lived a simple life with his wife’s family and worked at a canning factory. On this handwritten version of that same census, Henry is listed as working as the manager of a canning factory. That would be Van Camp Canning, later named Stokely Van-Camp. He later moved into a kind of sales position (as I understand it), which allowed him to travel across the globe. My grandma has some neat framed photos of Italy that he brought back from a business trip. I doubt that many jobs in the 1920’s required international travel, so that is another really unique aspect about Henry. In 1920, their first child, Dorothy Jean, was born. (Sadly, she passed away in 1963, so I never got to meet her.) 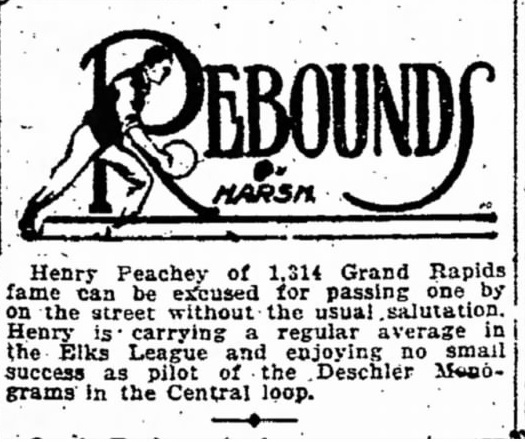 In 1923, Henry and Ida had their first boy, named James Henry Peachey. I knew him as Uncle Jimmy. I did get to meet him, and I always enjoyed his visits to his sister, my Grandma, in Camby. By 1930, they had 3 children, now including my grandma, Mildred Frances. She is listed incorrectly on this census as Mary. It also incorrectly lists Henry’s birthplace as New York. Every other source I have found on him says he was born in Chicago. I don’t have many records from 1930-1938, but Grandma says she had a great childhood and that Henry was a wonderful father. I believe she has some letters he sent her while he was away on his trips, and they mention how much he misses her and can’t wait to see his family again. I gather from his letters to my great grandmother that he was a loving and committed husband and family man. Now comes the part I hate. 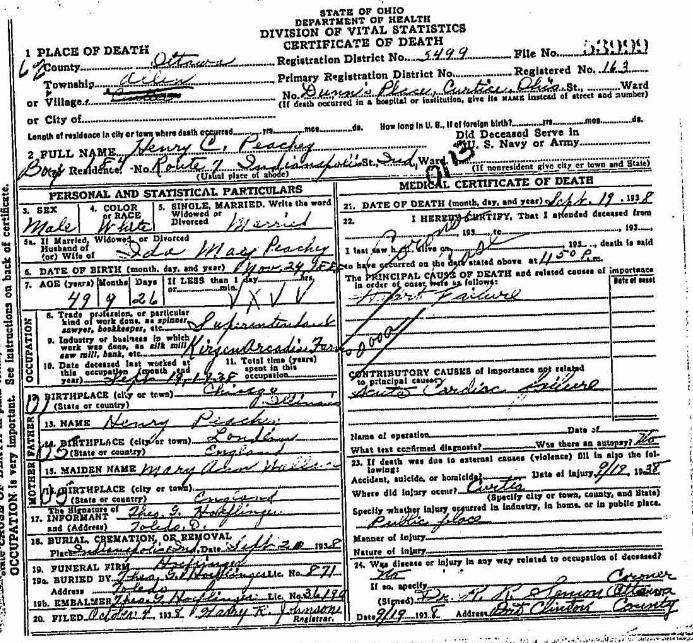 Unfortunately, Henry passed away suddenly in 1938 while on his way home from a business trip to Ohio. The cause of death is listed as acute cardiac failure. I can tell from pictures that he was a slim man, though that’s not always a necessary indicator of heart health. In any case, Henry was taken too soon. My great grandmother and her children, grandchildren, and great-grandchildren (myself included) if given the choice, would have preferred that this very interesting man lived to be 100, to share his stories, wisdom, and love with us. However, I think there is yet something we can learn from the life of Henry Charles Peachey: In his 50 years, he LIVED. He traveled, he worked hard, he was witty, he found something he was good at and kept at it, and he loved his family dearly. Henry died young, yes, but he only died once. His was not a life lived passively. No, Henry firmly grasped the reins of life with both hands and a smile on his face. We honor his memory best by doing the same. This entry was posted in Ancestor Spotlight. Bookmark the permalink. Hi there, I found your blog in a random search online. I too am descended from Henry D Peachey, his son George would have been my great grandfather. Would love to connect and share info. Hi Megan! So sorry I just saw this comment. I’d love to connect! Email me at hoosiergenealogyadventure@gmail.com. 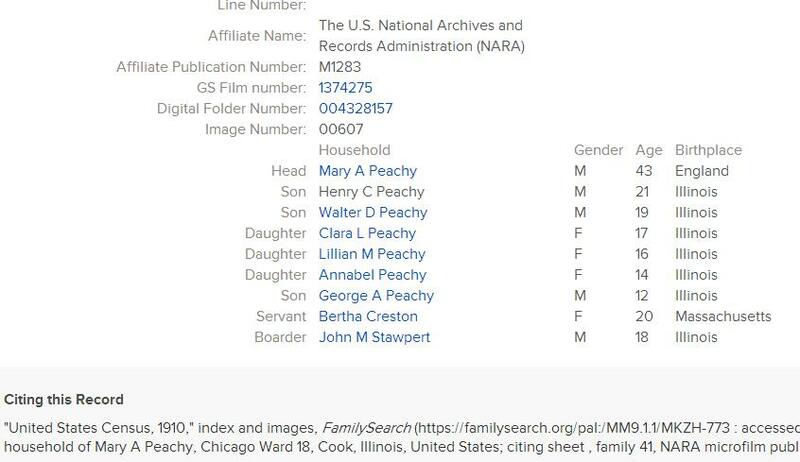 My grandma is Frances Peachey, Henry Peachey Jr.’s daughter.